A new metal roof was recently installed on this 3 Bd/2 Ba home with a double-car garage and workshop. The house has new carpet, paint, updated bathrooms and kitchen. There is a covered patio and a ramada. Very nice 1300 sq ft house, 3 bed + 2 bath with many new appliances. Gas heat and central A/C. Some furniture included. Quiet dead end street. 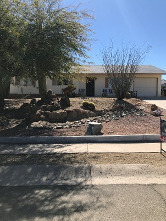 Yard features a broad Mesquite shade tree and desert landscaping. Awesome interior with all new features throughout house, a must see to believe 3bedroom/2bath. 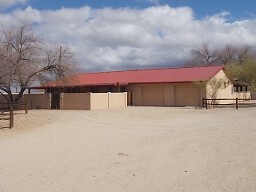 Appliances included, great views of desert.